It seems as if Eddie Murphy is running out of steam. It's undeniable that the comic-turned-movie star can have an audience in stitches given the right material, but his latest Hollywood projects just won't let him be great. His latest endeavor, A Thousand Words, is no exception. Reportedly shelved for four years, the film progresses as if it's still the 1990s, even borrowing its share of stale jokes and lame premise from its not-so-distant cousin, the 1997 Jim Carrey comedy Liar, Liar. Murphy plays Jack McCall, a book agent and family man who's never short of words, which he uses to snake his way through every situation. But he gets himself in a pickle when he makes an deal with spiritual guru Dr. Sinja (Cliff Curtis), who's written a book on new age healing. Soon after to his surprise, Jack finds a Bodhi in his backyard, and learns that every words he speaks a leaf falls off the tree. And, worse, every leaf that falls brings him one step closer to death. Or, something. So in the beginning of the movie the audience chuckles watching Murphy rely on his keen physical comedy genius to outrageously mime entire dialogue, supported by his trusty sidekick Clarke Duke (who plays Jack's accidentally hilarious loyal assistant, Aaron). Then the movie transforms into an entirely different film. Jack is forced to have an attack of conscious when he realizes his already flailing marriage is on the skids, his job is in jeopardy because he's quite literally phoning it in at the office, and he's all of a sudden plagued by the absence of his father, which turns the whole second half of the film into a grim melodrama. All the while, the Bodhi is shedding left and right. But let's try to forget about the fact that this movie is propelled by leaves falling off a tree. Why turn what could have been a 90-minute slapstick into something with a tacked on, contrived message? Once again, that's just not the Murphy we know and love. Neither is Kerry Washington. It's no question that her career is on fire at the moment, but we're sadly left disappointed by the fact that she got wrapped up in a movie like this (same goes for Curtis, who can't seem to find his footing in Hollywood). Playing Jack's desperate wife Caroline seems fun enough for Washington, but far beneath her at this point. But Ruby Dee, who plays Jack's mom Annie, makes the most of a weak script by delivering a vulnerable and memorable performance of a woman slowly losing her grip on reality. Her scenes almost made you forget you were watching a bad movie. Almost. A disastrous comedy at times, with a few unexpected touching moments sprinkled throughout, A Thousand Words fails to come together like it should, and becomes a forgettable mess. I saw the extended trailer for this in the theater and had great hope that it might be Eddie's comeback vehicle (especially after THE TOWER HEIST). Sad that it's not. Oh, how the mighty are fallen. Not unexpected but sad none the less, Murphy is capable of so much more. Thanks for the review. I was hoping this movie would be a good one for Eddie. This movie came out of nowhere for me. I saw that one of the local theaters here is playing it and I had never heard of it before. I guess this would be why! 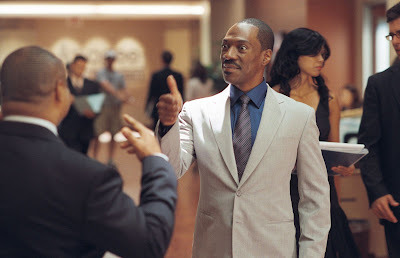 This movie puts to rest any idea of Eddie Murphy having a come-back and should have just stayed on the shelf like it's been doing for the past 4 years. As you can tell, I did not enjoy myself while watching this flick. Good review Candice.